The current custodian of Hacienda La Clementina appointed by the SRI (Internal Revenue Service) Dr. Max Ordenana Carrion, has started the logging of teak from the cattle farm El Tejano without any legal base, since that property has not been seized due to the suspension effects of the Direct Action currently in force. We ask ourselves, if the SRI has announced the alleged auction of Hacienda La Clementina to be carried out within a month. Why exploit the teak forest and dismantle an asset like the cattle farm El Tejano, causing a decrease in its value? What is the custodian of Hacienda La Clementina, appointed by the SRI, is going to do with this wood? The duty of this custodian is to preserve and protect the value of the seized property. How is it possible that, with the full knowledge of the SRI, this custodian has started a process of depredation and the damage of a property which has not been seized, and, on which, he has no authority? To whom he is planning to sell the teak? Why he has not made the process public? For what purpose he is using the teak right now? It is inadmissible that the SRI and the Ministry of Environment allow all this abuse, that the custodian Ordenana is carrying out, exploiting the wood and selling it without any legal base. 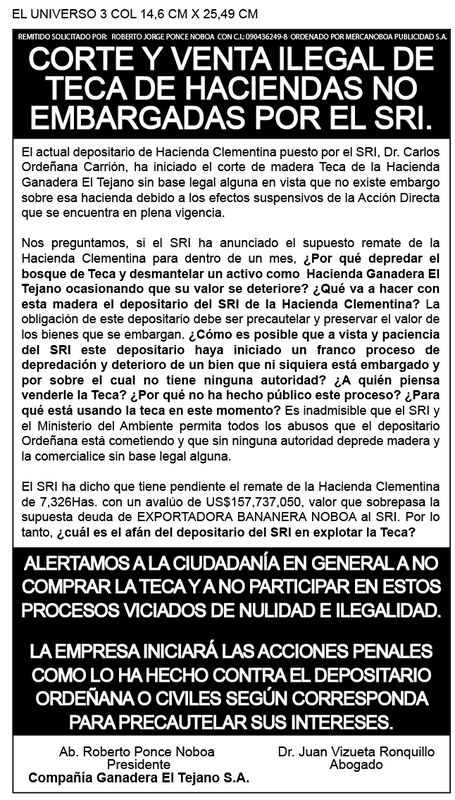 The SRI has said that the auction of Hacienda La Clementina is pending, which has 7.326 Has. and was valued in US$ 157’737.050, number that surpasses the alleged debt that BANANERA NOBOA EXPORTING COMPANY owes to the SRI. Therefore, what is the custodian’s need to exploit the teak? WE WARN THE ALL CITIZENS NOT TO BUY THE TEAK AND NOT TO PARTICIPATE IN THESE PROCESSES WHICH ARE INELUCTABLY NULL AND ILLEGAL. THE COMPANY WILL TAKE CRIMINAL ACTIONS AS IT HAS DONE BEFORE AGAINST THE CUSTODIAN ORDENANA OR ANY CIVILIAN, ACCORDINGLY, TO PROTECT ITS INTERESTS. Cattle Company El Tejado S.A.